Just in time for the holiday that celebrates true love with flowers and chocolate hearts, Hudson Shakespeare serves up a Valentine that only the Bard could deliver. 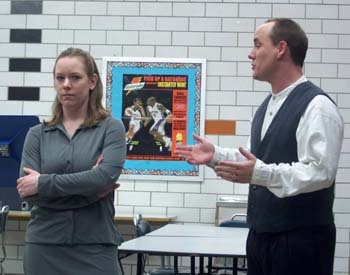 Starting off 2004 with the first of many showcases, HSC presented selections from some of Shakespeare's most immortal and dysfunctional couples for our debut in Kenilworth, NJ. This showcase offered up different takes on what it means to be in love. From the famous balcony scene of two star crossed teenagers professing their love in the shadows to the grotesque Richard III, who successfully woos the wife of the man he just killed, Shakespeare Valentine's celebrates love Shakespeare Style, where all that glisters is not gold and the most successful relationship is a between a pair of murderers. Showcase scenes include selections from Romeo and Juliet, Hamlet, Taming of the Shrew, Much Ado About Nothing, Richard III, Macbeth and Shakespeare's Sonnets. 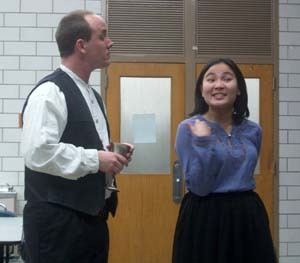 Petruchio attempts (Jon Ciccarelli) to woo an unimpressed Kate (Francine Tychcuaco). "A join'd stool" as the wooing gets desperate. Richard III - Act I, Scene 2 "Encounter with the mourning Lady Anne"
Richard (Jon Ciccarelli) disturbs the funeral procession of the late king. Lady Anne lashes out at Richard her husband's killer and future husband. Hamlet - Act III, Scene 1 "Get thee to a nunnery"
Hamlet (Rich Warren) ponders fate, life and his next move in his most famous soliloquy. Love turned to supposed betrayal as Ophelia is caught between duty to her father and her lover. Much Ado About Nothing - "Various scenes from the first half of show and Act V, Scene 2"
Beatrice (Francine Tychuaco) begins a spirited encounter of wits with Benedick (Rich Warren) in the beginning scene of the play. 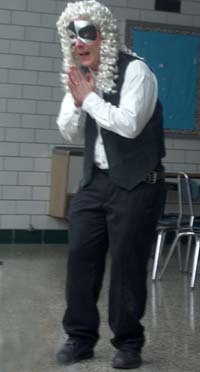 Benedick dons a disguise during the masquerade scene to fool Beatrice into thinking he is someone else. Benedick finally smitten attempts to find the best note to express himself to Beatrice. Macbeth - "Various scenes from the show and Act V, Scene 2"
Macbeth (Jon Ciccarelli) and Lady Macbeth (Heather Girardi) reunite after along absence. As ambition burns in Lady Macbeth to kill the king, she strenghens her husband's resolve..
Life thrown asunder as Lady Macbeth laments the life she's lost and recounts her and husband's downfall in the famous sleepwalking scene. Sonnets - "30 selected sonnets describing the evolution of relationship"
Romeo and Juliet - "The Balcony Scene"
Prior to revealing each other, Romeo (Rich Warren) and Juliet (Francine Tychuaco) from different perspectives as they ponder each other. A Midsummer Night's Dream - "Encounter with Titania and Oberon"
A precocious Titania taunts her husband Oberon for his many indiscretions, but is rebuffed as Oberon recounts hers. A less than happy Lysander (Rich Warren) under the spell of the love potion is reunited with his former lover Hermia (Francine Tychuaco) and he summarily dismisses her.